A large number of events have occurred over the last few years, all steps leading toward the complete takeover of America. We have seen veterans attacked and demonized, religious groups labeled as extremists, conservatives, constitutionalists, survivalists all declared a greater threat than the terror group ISIS, our sovereignty handed over to the UN, foreign troops training on American soil, NATO vehicles brought in to the US, and more recently, military exercises geared toward "uncoventional warefare," to be practiced in America while treating "gun-friendly" states as "hostile terrority." That and much more will be shown, with source links, below. First and foremost is American sovereignty to which in September 2013 the Obama administration signed on and supported a controversial U.N. treaty on arms regulation to which Senator Jim Inhofe was quoted as saying "The administration is wasting precious time trying to sign away our laws to the global community and unelected U.N. bureaucrats." Under the guise of "protecting" the global community, the Obama administration is willing to sign away America's Second Amendment rights and hand the UN the right to invade US in order to disarm gun-owners. In June 2014, Activist Post ran across a very disturbing UN help wanted ad, stating "These positions are located in field missions of Peace Operations. The DDR Officer typically reports to the head of a work unit or to a senior official responsible for DDR operations in a field location, though this may vary depending on the mission structure. The focus of these jobs is to lead the planning, implementation, monitoring and evaluation of DDR programmes, operations and other related activities in the country or region concerned." According to that report there was no other reference to a "country or region concerned" other than the "duty station" in New York which is also the location of U.N. headquarters. For those unaware of what DDR stands for, it is clearly stated in the UN header shown below. Along with countless eyewitness reports of encounters with foreign troops in America, it was reported in 2013 that for the "first time in history" the Obama administration "invited Chinese troops to train with our military on U.S. Soil," just weeks after Chinese state run media reported that China had nuclear submarines capable of wide spread attacks against the US. In August 2013 it was reported that 15,000 Russian troops were requested by the Obama administration for a “training” exercise on US soil to "assist FEMA" during emergencies and disasters. That followed May 2012 news of Russian troops carrying out "joint anti-terrorism drills in America, with Huffington Post stating it marked the "fist time Russians have trained on US soil." It is noteworthy that both China and Russia are permanent members of the United Nations Security Council to which the Obama administration signed away America's sovereignty to, meaning the UN could request both Chinese and Russian troops invade the US in order to disarm gun owners, using the "small arms and light weapons" language which is part of the UN treaty on arms regulations, shown above. 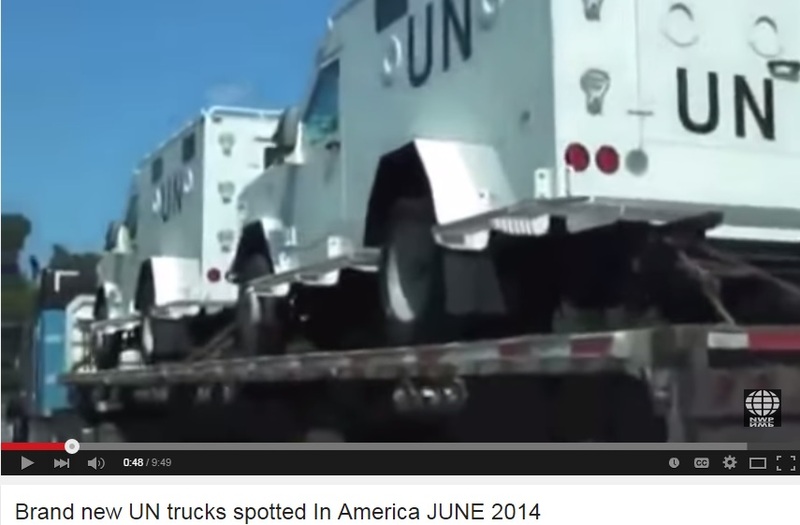 For the last five years we have seen countless videos taken by concerned citizens of UN armored vehicles being transported all across America, video after video uploaded and distributed across the Internet, with many asking if they are simply manufactured in America, but no official word where these UN armored vehicles are coming from or where they are being delivered. One such example is shown below this article, but anyone can go to the YouTube search page and see the vast amount of proof that they are here. In addition to multiple reports of encounters with foreign military in the US, a 2013 eyewitness report, with photos, states "I recently received a report being distributed by a "Sherrie Questioning All" of Tennessee. (Full name removed at her request. )She had taken photographs of DHS armored vehicles being delivered from Kentucky to Tennessee. What makes this interesting is that the drivers were not AMERICAN military, but rather FOREIGN military troops driving these vehicles." It continues on to say "When American people spoke to these foreign drivers, they detected they were either Russian or Eastern European/Slavic in background." TURNING US CITIZENS INTO "THE ENEMY"
In a recent ANP article titled "The Endgame Is Here! America Surrenders Militarily While Preparing For War Against US Citizens," we went over how the Obama administration has purged hundreds of military commanders, weakened and dismantled out US Military while Russia, China and others are strengthening theirs. 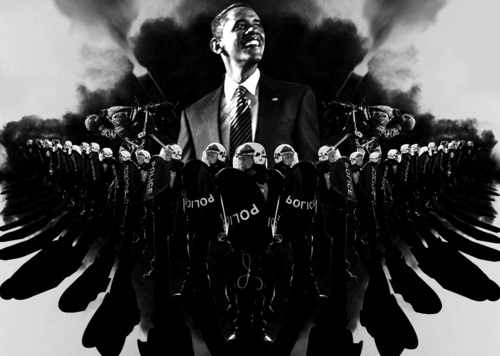 Included in that report was a section labeled "US GOV'T PREPARES FOR WAR ON IT'S OWN CITIZENS," where we noted that while defense spending has been decreased, DHS funding has been increased, while recent actions on the part of the Obama administration and associated federal government agencies has turned US citizens into the enemy. DHS has labeled "right wing extremists" a greater threat than the terror organization titled ISIS, who behead journalists and aid workers, kill Christians across the global, burned a Jordanian pilot in a cage, then filmed it all and released the videos to the public. In 2013 it was reported that Army training material listed Evangelical Christians, Catholics and some Jews as "religious extremists," alongside "the Ku Klux Klan, Hamas and al-Qaeda." Perhaps one of the most disturbing, visual examples of the type of "targets" our militarized police are being trained to take out, comes from 2013 reports, where it was revealed that law enforcement agencies were using actual targets that represented the threat.... of "pregnant women," and "children." Images of those "targets" are provided in the article linked above. Which brings us to the present day, where news of the military training exercise set to take place, named "Jade Helm," actually lists US states as hostile as our military trains in "unconventional warfare" against Americans. While the US military is pushing back hard, calling those very concerned about this type of exercise "conspiracy theorists, former military experts are calling this "unprecedented and dangerous." Whether it is an economic collapse, a natural disaster or any other scenario which could cause nationwide chaos, the steps outlined above been taken in a carefully orchestrated manner, incrementally as to appear as separate individual events, but which creates the perfect conditions of a UN takeover of America, nullifying the US Constitution and pulling the US into a "one world government" subject to global laws rather than American laws. Those that would stand up against that, fight for American sovereignty, have already been labeled "the enemy." Note - Many may see the series of actions shown above, in a different light, we don't ask readers to connect the dots as we have, we DO ask readers to utilize their brain and their serach engines, click the links above or find others, and come to their own conclusions. Feel free to debate those conclusions in the comment section below.... we only ask that readers be civil to one another, discuss, debate, or even try to debunk, but do not attack one another.